Apple Pie! 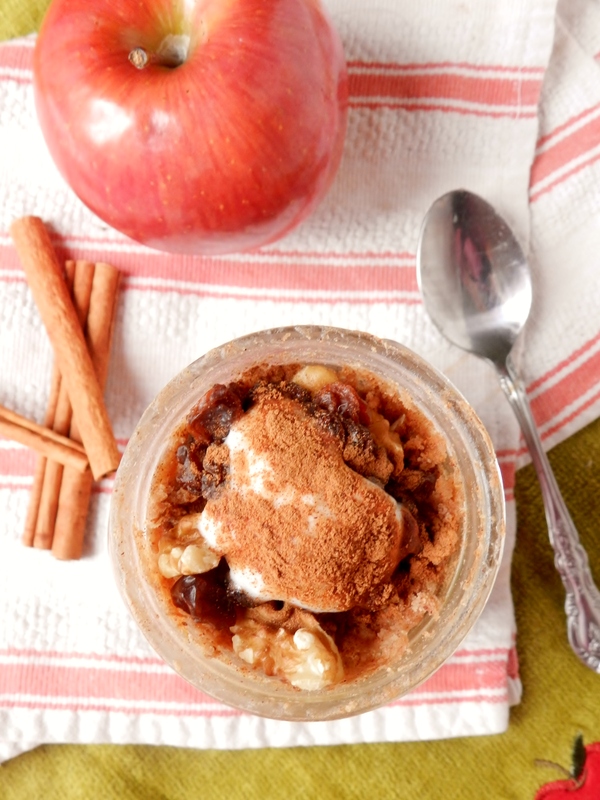 Consisting of soft, sweet cooked apples, plump and juicy raisins, crunchy walnuts, and of course a fluffy “pancake” laced with ribbons of apple butter, this is an apple-pie lovers dream come true! Of course, this also has plenty of cinnamon, too, but that goes without saying, doesn’t it? In a medium-sized bowl, combine all the dry ingredients. Add the almond butter, milk, and vanilla extract to the bowl and stir until everything is just combined. Add the apple butter to the batter, and gently stir, just to swirl the apple butter in, but not to stir it in completely- you want ribbons of apple butter! Dice up the apple into small pieces. 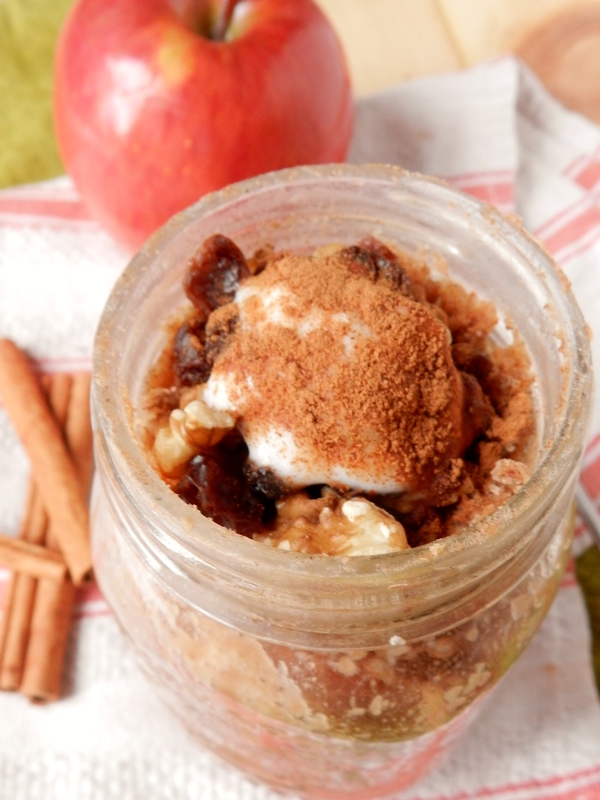 Mix the apples and the raisins together and divide evenly into the bottom of two medium-sized mason jars. 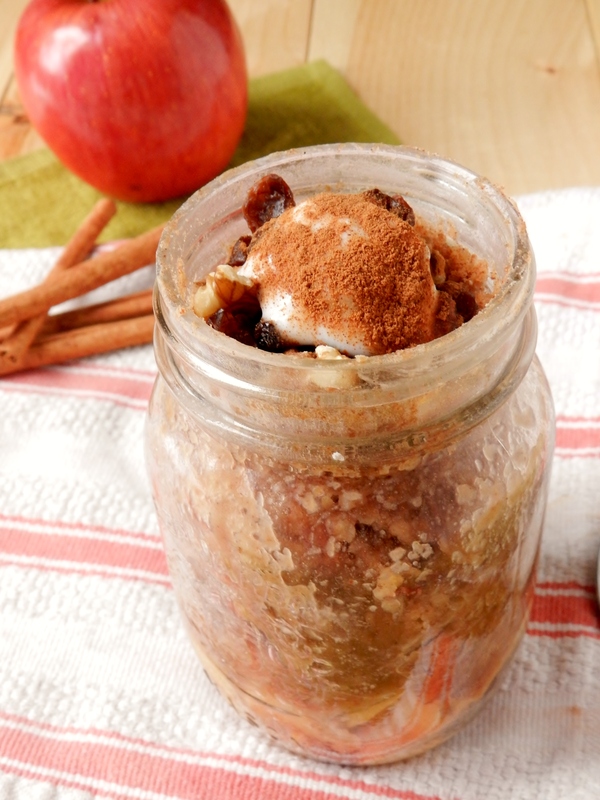 Divide the batter in half and spoon into the jars on top of the apple and raisin mixture. Place in the microwave and cook on high for 4-5 minutes, or until the dough is firm to the touch. Top with additional almond butter, yogurt, cinnamon, raisins, walnuts, ect. and enjoy! Do you like apple pie? What flavour of pancake-in-a-jar would you like to see us make? Posted in Uncategorized and tagged almond butter, apple, apple butter, apple pie, apple pie pancake, banana version, breakfast, c raisins, cinnamon, cooked apples, easy, food, healthy, jar, mason jars, microwave, pancake, pancake in a jar, quick, raisins, sugar-free, walnuts, whole wheat, whole wheat flour. Bookmark the permalink. I have had a very busy week but am finally able to read some blogs again. What a treat it is to come back to see three lovely new recipes. I’ve never had bread pudding in my life, but that along with this recipe definitely appeals to me! Wow this idea is amazing plus love the flavour you went with. I love apple pie. How about a carrot cake flavour with carrot, walnuts and somehow cream cheese? Hi, this looks scrumptous as do most all your recipes. I have nominated you for the Liebster Award!! Go here: http://correnadotme.wordpress.com/2013/03/14/the-liebster-award/ for the details!